Swimming provides relief from fatigue and stress. It is also a form of full body exercise. Many people take a swim in the morning or when they get off at work. However, they must also know how to care for swimming pools to ensure safety and hygiene. The best pool cover is beneficial for home and commercial pools. A pool cover is an important accessory for pool owners. Accidents occur every year because of kids and pets falling in uncovered and unguarded pools. In such cases, it poses dangers to family members. Many have proven that pool covers can be life-saving. There are various sizes, shapes, and types of swimming pool covers. 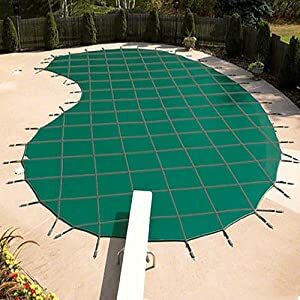 This article will cover how pool covers work, their different types, and features of the best ones available in the market. 1.1.5 5. 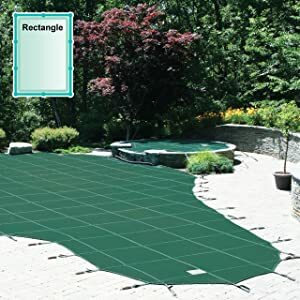 Rectangle Meyco Safety Pool Cover 20 x 40 ft. This is the best pool safety cover because it protects an inground swimming pool from severe winter in just one simple step. The lightweight mesh and the two-ply webbing allow rain to seep through into the pool. However, it does not let twigs, leaves, and other debris to go in. You can install and remove this safety pool cover system in minutes. Includes all hardware like spring, hooks, solid brass anchors, and an installation tool. The best inground pool covers are durable enough to support the whole family. However, it is also light enough that you can put it on and remove from the pool in just a few minutes. The anchoring system firmly secures the anchors in concrete. It has a multi-seamed stitching that prevents wear and tear and guarantees safety. The stainless steel hardware can withstand damage from the environment. It is designed to allow water through, but keeps the pool from dirt and debris. This heavy-duty safety pool cover comes at an affordable price. You can use this not just in the winter, but all year round. It comes with a 12-year warranty. The two-ply mesh material can resist sunlight, rot, harsh chemical damage, and mildew. Comes with installation tool, storage bag, brass anchors, and stainless steel springs. Mesh construction make water drainage possible, while shutting leaves and debris out. You will have an easier and quicker time to clean up. This Loop-Loc safety pool cover is constructed with a new thicker weave that nearly blocks all sunlight. However, it still allows melting snow and rain to easily drain through. If you want less debris and light in your pool, this is the right choice for you. It still offers exceptional protection as it is durable enough to support the weight of not only a small child, but also an adult. Includes hardware for cement installation. Strong mesh construction that blocks sunlight. 5. 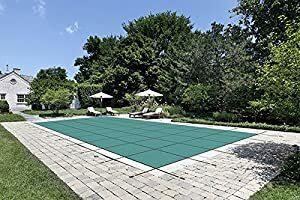 Rectangle Meyco Safety Pool Cover 20 x 40 ft. It has been proven time and again that Meyco safety pool covers are durable enough to support the whole family. This particular pool cover is not an exception. However, it is also light enough to take on and off from the pool in just a matter of minutes. You can be sure that your kids and pets are safe from accidents. Made from ultra-strong two-ply mesh that has break strength of up to 4,000 lbs. The spring-loaded anchoring system can securely hold the cover in place. Resists chlorine damage, sunlight, rot, and mildew. Allows water to seep through, but keeps leaves and debris out. 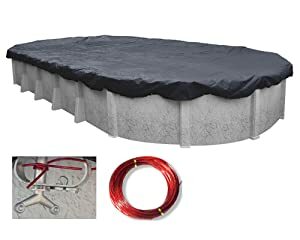 This pool cover has the strength of other pool covers that cost twice as much, which is why it is considered by many as the best winter pool cover. Its well-built coating and polyethylene scrim can resist the harshest winter weather. This cover has an 8-year warranty. Protects against wind, sun, and snow. Includes winch tightener and heavy-duty cable. 4-feet overlap that fits most top rails of above ground pools. The underside prevents algae growth. 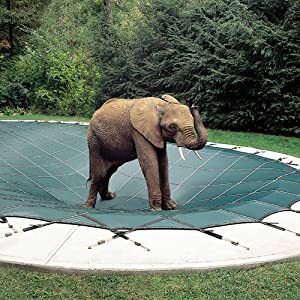 This pool cover is well-recommended by its users because it gets the job done. Its heavy-duty construction can resist the elements. This product comes with an 8-year warranty. Comes with all-purpose stamped aluminum grommets and double-stitched borders to prevent from ripping. Includes winch and vinyl-coated cable for easy installation. It has UV inhibitors to protect it from sunlight degradation. This heavy-duty pool cover is the best above ground pool cover as it effectively protects the pool during severe winter weather. Customers who use this cover during the winter and use the appropriate winterizing chemicals will open up a clean pool during spring time. Plus, the cover is so easy to open. • Made from heavy-duty polyethylene material. • Prevents dirt and debris from going through the water. • For better performance, all seams are heat-sealed. • It comes with 4-foot overlap, which makes it easy to install. • It has a 10-year warranty. 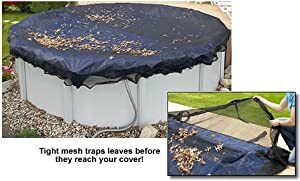 If you want to protect your above ground pool from falling leaves, this is the perfect leaf net top cover that you can use along with your pool cover. It comes with a ratchet and cable so it will be firmly in place over the pool cover. • Made from extremely heavy-duty, woven material. • Removal of leaves and debris is quick and easy. • Catches even the smallest leaves. 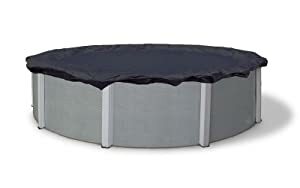 • Easily stretches over winter pool covers. • Works with the best solar cover for above ground pool and other solar covers. This winter pool cover is ultra-strong, yet comes at an economical price. This cover is triple laminated for added durability. It has UV light inhibitor that protects against the damaging rays of the sun. The triple thick hems are double-stitched using UV-resistant nylon threads. Reversible black and blue color. It comes with a two-year full and 10-year limited warranty. There are several ways swimming pools can lose heat, and evaporation is definitely its biggest source of energy loss. In an outdoor pool, the evaporation rate depends on the pool’s temperature, the wind speed at the surface of the pool, and air temperature and humidity. Lower humidity and higher wind speed and pool temperature means greater evaporation rate. To reduce evaporation in windy areas, you could add windbreak, such as a fence, shrubs, or trees. The windbreak has to be high and close to the swimming pool. This way, it will not cause turbulence over the pool as that can increase evaporation. The windbreak should also not cover the pool from the sun because the sun can help provide heat to the pool. An indoor pool does not suffer from the environment. Nevertheless, it can still lose lots of energy from evaporation. It even requires room ventilation to control humidity due to the huge amount of evaporation. Ventilated air also needs conditioning, and this adds to the energy costs. For both indoor and outdoor pools, the best swimming pool cover can minimize evaporation. Covering a pool that is not in use is the most effective way of cutting energy costs. You can save as much as 70% energy. On indoor pools, pool covers reduce the need of ventilating indoor air and instead, use unconditioned outdoor air. When you cover indoor pools, there is also no need for exhaust fans, which can save even more energy. Also known as bubble covers, solar pool covers are probably the most affordable of all the options. The cover absorbs the warmth of the sun during the day and helps in keeping this warmth during the cooler temperatures of the night. The only pool cover that can make the water temperature higher. Cuts down water costs by reducing evaporation by as much as 99%. Keeps debris and dirt out of the water, which reduce the chemicals required to sanitize the water. Without a roller, solar pool covers are difficult to roll when taking on and off. Cannot hold the weight of a small child or animal. Not as good as thermal pool covers in insulating the water. As the name suggests, this type of pool cover automatically opens and closes with just a push of a button. An automatic pool cover is extremely easy to use. More secure than other types of pool covers. Can support the weight of an adult. Expensive – costs around $2,500 to $8,000. It does not heat the pool’s water. Many pool owners consider thermal pool covers as one of the best pool covers. They are made from insulating foam material. You need a professional to install this type of pool cover. Reduces evaporation by as much as 98%. Completely blocks the UV rays of the sun. The sun cannot damage the cover. Prevents harmful algae from growing. Retains heat better than a solar cover. Can last longer than solar covers. Easy to use and pack away. More expensive compared to solar covers. Does not heat the water really well. People who buy winter pool covers mostly close their pools during the winter season. 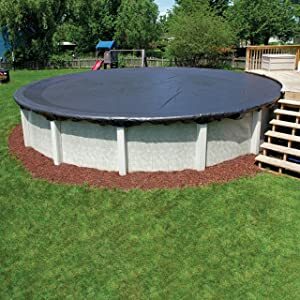 However, you can use this type of pool cover all year round. The cover keeps out precipitation, extreme temperatures, and winter winds that may cause frost damage. Reduces effective sunlight, which limits algae growth. This leads to savings in maintenance and cleaning costs. Relatively inexpensive – price range is between $150 and $700. Requires you to install anchor points around the pool. Does not heat water and retain heat. Not as good as other pool covers in reducing evaporation. Hidden swimming pool covers are the best pool cover if you value aesthetics. The roller and cover are held in a sunken part at the end of the swimming pool. It has a lid that hides the cover and roller. It looks appealing. 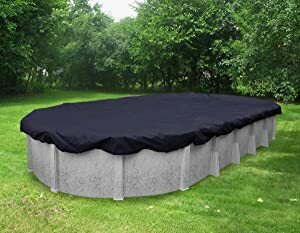 When it is put away, it is not visible compared to other pool covers. You have the option to roll it on the water semi-automatically, automatically, or manually by using a hand crank. It is not so easy to install in existing pools. Can be expensive, particularly the automatic ones. A mesh pool cover allows snow and rain water to seep through the cover and into the swimming pool. On the other hand, a solid pool safety cover uses a pump to remove the water from the cover. 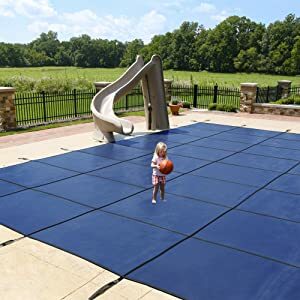 It is typically lighter compared to a solid pool cover. Easy to take on and remove from the pool. When it rains, you do not need to pump water from the pool cover because a mesh cover allows snow melt and rain water to seep through. The leaves dry out when the pool cover is dry. The wind will just blow them off. You do not need to sweep. When the snow melts or it rains, the dirty water from the leaves and debris will be in the pool. There will be lots of debris at the bottom of the pool. You will need extra effort and time to clean it up. Keeps the pool water clean by protecting it from snow melt, rain, and debris. If you close the pool correctly, you will have higher chances of opening up a clear pool. It is heavier to take on and off the pool than a mesh cover. You must drain the water from the cover. Choosing what pool cover to buy is an important decision you have to make if you want to get extra savings. This review pretty much includes the best pool cover. Remember that a pool cover is an excellent device that seals your pool to keep you and your children safe from accidental falls.